Let's start with materials, shall we? 2-3 Polishes. 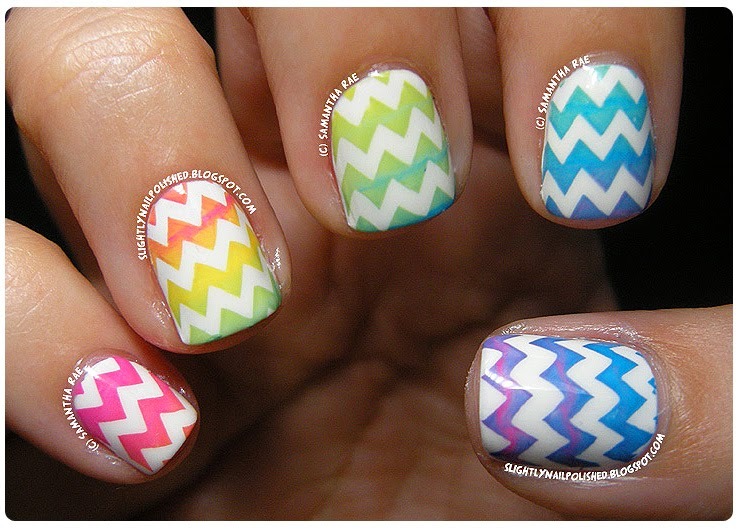 You can ultimately use any number of polishes to create this look but I suggest 2-3 polishes per nail. 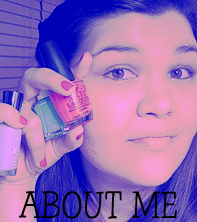 Today I'm using Brisk Blue, In A Splash, and Lively Lilac by Sally Hansen Insta-Dri. 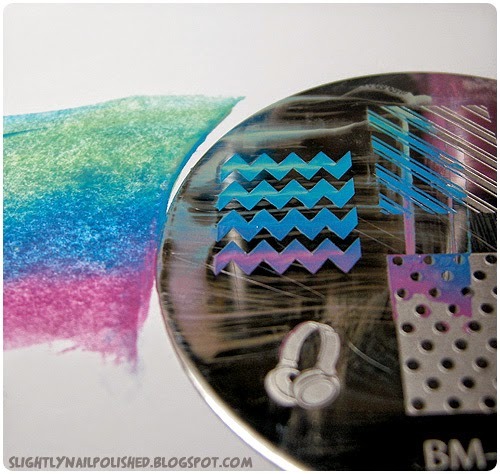 Just remember that you're gonna be stamping with these polishes so you want them to be opaque and a little thick. I suggest fast drying polishes or metallics. A Large Stamper. 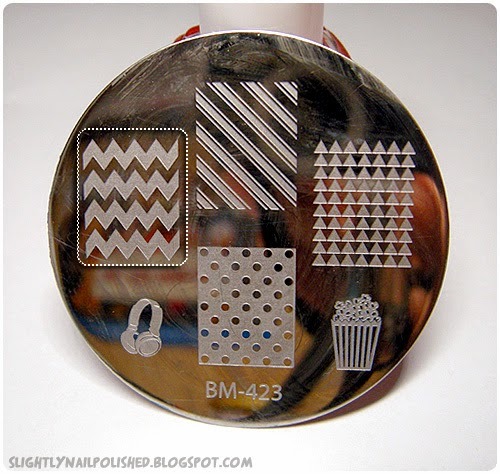 I have an XL Stamper from Winstonia pictured here but you can use any stamper you like. Just make sure that you can fit the entire image. A Scraper. I'm using an old screen protector application card but you can use a standard scraper if you'd rather. Or better yet, an old gift card! A Stamping Plate. I'm using plate BM-423 from the 2013 CIY Bundle Monster set. When looking through your collection, you should keep an eye out for a large image. That way you can see more of the fade from one color into the next. (Not Pictured) Acetone. For clean up. (Not Pictured) An Angled Brush. Again, for clean up. (Not Pictured) A Base Color. I'd go with a white or black for this one. Especially if you want your gradient to really pop! Now that we have all our materials, let's get started! You're gonna need to bite the bullet and pick out an image to stamp. This can be really hard, so let me give you a tip. As mentioned in the materials section, you want an image that has a lot of etched area. Those reverse polka dots are a perfect example! But for today, we're gonna use the chevrons! After you've picked your image, apply your base color to your nails. Let it dry to the touch. Seriously. Let it dry for an hour, at least. 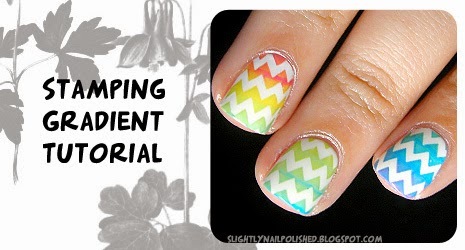 You want your nails to be really, really, REALLY dry for stamping. Now that you have your image selected, and dry nails, you're gonna pick the colors you want to use, then apply them to your plate. With these chevrons, I applied them going with the stripes. I have the colors butted up against each other, as close as I could get them without getting the other color on the brush. Next comes the scraping. Here is where the magic happens. This step, and the following steps, have to happen fast! You don't want the polish to dry on the plate or you're gonna have to start over. Following the horizontal pattern (as well as the stripes of polish you've already applied), scrape the card/scraper gently against the plate. Don't worry about getting all the excess polish off in the first go, you're gonna go over it again with the scraper again. Repeat step 3. 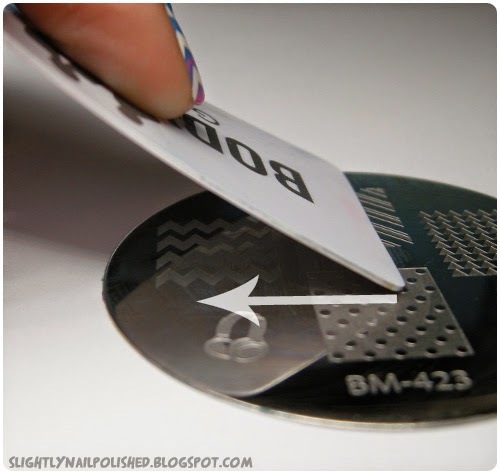 Yes, scrape the card/scraper gently against the plate again and again. 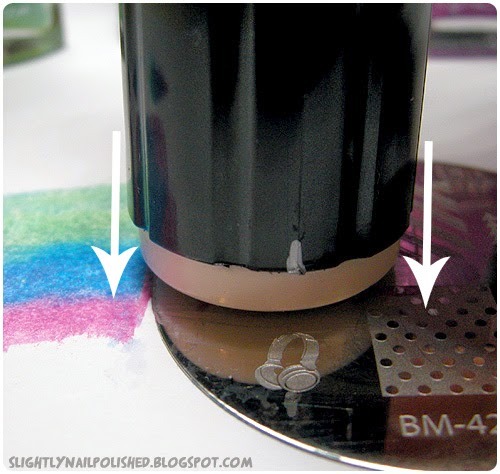 Depending on how blended you want the colors to be, scrape anywhere from 2 to 4 times. Just remember that you have to do it quick. The longer the paint sits on the plate the more likely the image wont pick up fully. What this step does, in my opinion, is re-applies the polish you've already scraped off. So passing the colors back over the image blends them together! 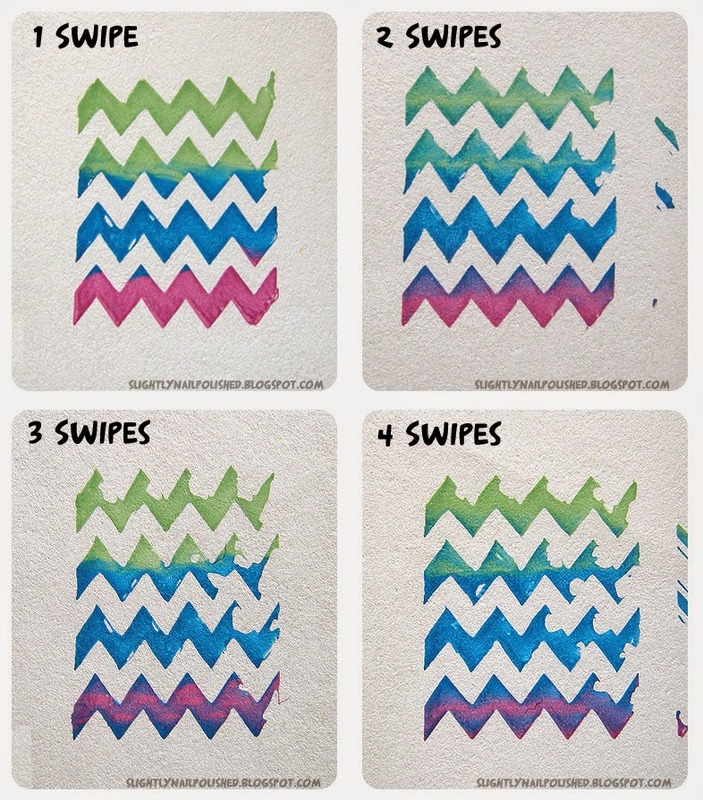 Which is why in swipe 3 and 4 above, you can see purple in the blue and blue in the green. When you're done with the scraping, you'll have something like this. This image was scraped 4 times. It's VERY blended and ready to be picked up! 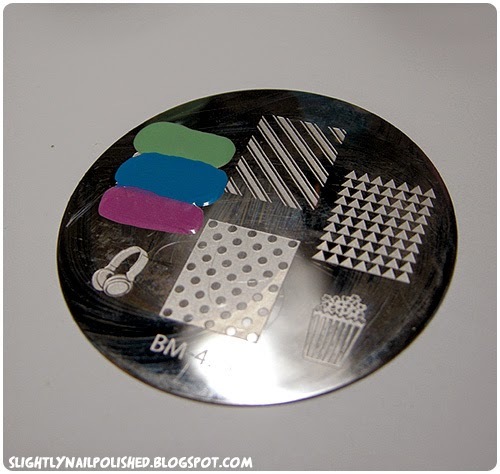 Really quickly after scraping the polish off the plate, pick your image up with your stamper. You want to press down evenly in a straight up-and-down motion. It should sound like a suction cup releasing. Here is another tip. You see the silver mark on my stamper? 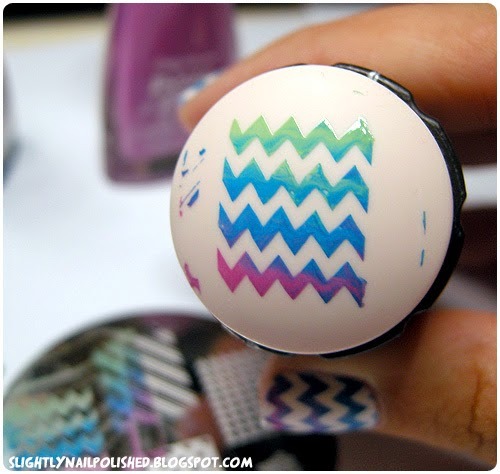 It is a marker to help me remember where the top and bottom of the image is on my stamper. It's a simple thing to add to all your stampers, but helps a lot, surprisingly. If everything has gone well (and you were fast enough) you'll have a clean, crisp, full image on your stamper. Yay! Congrats! Needless to say, I didn't come up with this technique. I've seen it done a few times on numerous YouTube videos and blogs. So the credit really goes to them because they're the geniuses who thought this up! Thanks to them, and you, for reading. Have a great day and happy stamping! *Polishes and supplies purchased by me. The opinions above are my own and should be taken as such.